Generals and Presidents | "Not About Quality"
Americans seem to have a kind of Roman relationship with our military leaders. America’s three most important wars are probably the Revolutionary War, the Civil War, and World War II. In all three cases, the commanding general was subsequently elected as a two term president (Washington, Grant, and Eisenhower). But making presidents of our triumphant generals is actually something from which Americans have moved away. 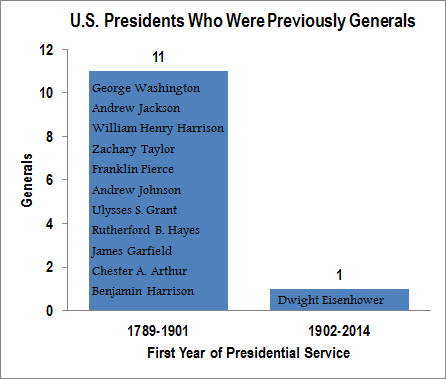 In the first half of our history, Americans elected eleven presidents who previously attained a general officer rank. Some were less distinguished in combat than others (Chester A. Arthur was Quartermaster General of New York), but most were genuinely important military leaders and/or war heroes. Jackson was the victorious commander of the Battle of New Orleans in the War of 1812, “Old Rough and Ready” Zachary Taylor commanded major victories in the Mexican-American War, and Rutherford B. Hayes was wounded in action during the Civil War. William Henry Harrison may have “died in 30 days,” but before his mediocre month in the White House he was the hero of the Battle of Tippecanoe. In the second half of our nation’s history, from 1902 to the present, Dwight Eisenhower is the only president who previously served as a general officer. Lots of other recent presidents served in uniform, but at lower ranks. That’s a pretty big change in our politics, and I think there’s two things going on here. One is that the military is relatively less prominent within the overall government than it used to be. It’s not that the military has diminished, but over time the domestic functions of government have grown much larger. James Madison vetoed legislation to build roads and canals, because he believed that federal funding for “internal improvements” was unconstitutional. Now we have not only the Department of Transportation and the Army Corps of Engineers, which exist to fund those same internal improvements, but also federal pensions (Social Security), federal health care (Medicare, Medicaid, CHIP, and the Affordable Care Act), and federal departments devoted to education, crime, housing, and small business, among other things. The President of the United States is expected to bring leadership to all of these issues, and voters now look at a candidate’s record on these issues during elections. The second development is that our wars have become almost exclusively foreign wars. The Revolutionary War, War of 1812, Indian wars, Mexican-American War, and the Civil War were all fought on American soil, or close to our borders (and in those cases, often on land that was about to become American soil). More recently, the Spanish-American War, World War I, World War II, Korea, Vietnam, Iraq, Afghanistan, and Iraq (again) were all fought overseas. Their consequences and their generals were further away from American voters. I’m not sure if fewer presidents with experience as generals is a good thing or a bad thing. It’s probably one of those things that’s more complicated than “Good thing or bad thing.” But it seems like an important change how Americans choose their president, which probably suggests a broader change in the relationship between the American people and their military leaders.